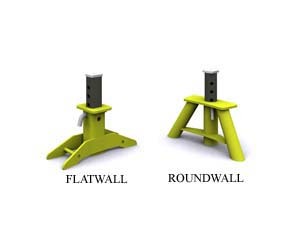 The Adjustable Pallet Support is designed to replace wood blocks, bricks, or whatever precasters use to raise pallets in order to pour short structures. 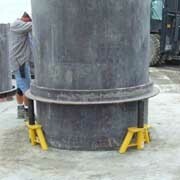 They increase EFFICIENCY, STABILITY, & SAFETY. 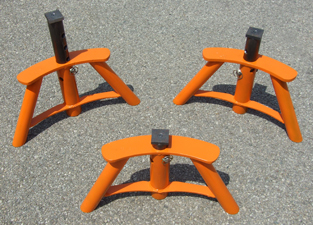 Adjustable Pallet Supports are CUSTOM MADE in our Machine and Tooling Shop. Available for Curved Wall and Flat Wall structures. The base supports are shaped to match the curvature of your molds, helping to virtually eliminate the possibility of the support tipping over. Each Adjustable Pallet Support has a 10,000# capacity. Heights starting at 6” tall.